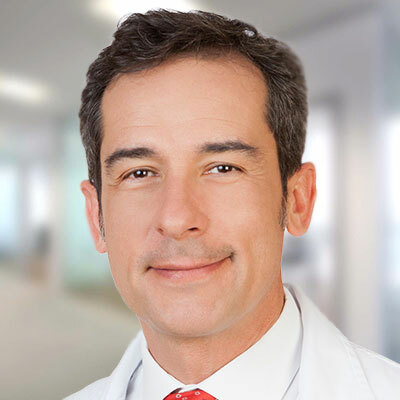 Home/Investigators and Research Centers/Investigators/José Serna, M.D., Ph.D.
Dr. José Serna is the Medical Director of IVI Zaragoza where he combines his management duties with his medical practice. He obtained his M.D. degree in 1993 at the Hospital Militar Universitario del Ejercito del Aire, Universidad Complutense de Madrid. During his last year at school, he pursued his enthusiasm in biology and basic research and was enrolled in the Growth Factor Laboratory at the Developmental Biology Department at Centro de Investigaciones Biológicas (CSIC) in Madrid. After competing medical school, he gained a predoctoral fellowship to investigate the role of insulin family of growth factors in embryo development. He then obtained his Ph.D. in Molecular Biology and Biochemistry and moved forward in basic research obtaining a Marie Curie Post-doctoral Fellowship fulfilling simultaneously clinical training and basic research in the Pediatrics Department at St. Bartholomew Hospital in London. In 2000, he started his residency training in Obstetrics and Gynecology in Fundación Jiménez Díaz with a special interest in Gynecological Endocrinology and Reproduction. He also worked as an Assistant Professor at Universidad Autónoma de Madrid Medical School and Nursing School. After his specialization, he joined IVI group as an attending physician at IVI Madrid for four years. Then he moved to IVI Bilbao as Chief Medical Officer and afterwards, in 2009, to IVI Zaragoza. He has been certified with the ESHRE Certification for Reproductive Endoscopic Surgeons. Dr. Serna teaches in several University Degree Programs and collaborates actively as lecturer and instructor in Experimental Surgery at Instituto Aragonés de Ciencias de la Salud (IACS). He is the director of several Master’s Theses in the field of gynecology and embryology. He acts as advisor in translational research in the Reproduction Medicine Group of the IACS. He belongs to the IVI Foundation where he conducts several research projects and he has received public and private funding for his research. Dr. Serna had numerous presentations in national and international meetings and has written and contributed to more than 100 publications, book chapters and conference proceedings. He is an Ad Hoc reviewer for leading reproductive journals including Fertility and Sterility, Human Reproduction, Human Fertility and Reproductive Biomedicine Online. An engaging example of translational medicine: the Wnt/?-catenin cellular pathway and pharmacological research in fibroid treatment. Unprocessed proinsulin promotes cell survival during neurulation in the chick embryo. Modulation of the chaperone heat shock cognate 70 by embryonic (pro)insulin correlates with prevention of apoptosis. Proc Natl Acad Sci USA, 95(17):9950–5, 1998. (Pro)insulin and insulin-like growth factor I complementary expression and roles in early development. Comp Biochem Physiol B Biochem Mol Biol. 121(1):13–7, 1998. Synthesis and differentially regulated processing of proinsulin in developing chick pancreas, liver and neuroretina. Flow cytometric analysis of whole organs and embryos. Curr Top Dev Biol, 36:211–22, 1998. Differential and tissue-specific regulation of (pro)insulin and insulin-like growth factor-I mRNAs and levels of thyroid hormones in growth-retarded embryos. Complementary roles of the insulin family of factors and receptors in early development and neurogenesis. Int J Dev Biol, Suppl 1:109S–110S, 1996. Et al. IGF-I and the IGF-I receptor in development of nonmammalian vertebrates.